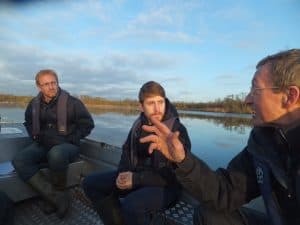 Severn Rivers Trust – Back in January, we had a visit from a fellow LIFE project based on the River Severn. When we met they were still in the process of applying for HLF funding. We showed them the Broad and talked to them about the HGB project and the experiences we’d had so far. They also gave us some of their thoughts and ideas. It was a very positive couple of days and a great opportunity to share information between projects. Year in Industry Student – Ruth, a biology student from UEA, started in January and has quickly slotted into the team. She’s been helping Doo with the access and engagement side of the project, Rhiannon with the water quality monitoring and Elaine with winter management of the Nature Trail. She’s started an online blog documenting her time with us. The first draft of the new Nature Trail signage – do you think Alex will mind holding them up for the whole season? Signage Drafts – Landmark have recently sent through the latest draft of the new signage that Doo, Rick and Elaine have been working so hard on. 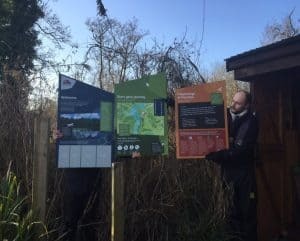 There will be around 10 new signs in total to go around the trail and the designs are looking great; using our honeycomb logo as a theme and natural shades so that they look as though they belong in the landscape. We very much hope that the signs will be installed in May. Press Day – BBC Look East, Farming Today, the Eastern Daily Press, Mustard TV and Radio Norfolk were invited to the Broad to see the work for themselves and interview Chris and Rick about the project. Though Storm Doris threatened the event Doo had worked so hard on, the day went well and the press representatives enjoyed their visit – you can find links to the fantastic press coverage here. It was great to get spread the word about some of the excellent work Natural England do. 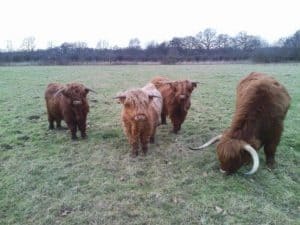 Highland Cattle – The Bure Marshes National Nature Reserve have brought in 4 new juvenile Highland cattle to help with grassland management. Mani, Andrew, Duffy and Bobby have settled into their new home and are getting along well with Netta and Marie, the older female cattle who already live on the reserve. From left: Mani, Andrew, Duffy and Bobby, between 1 and 3 years old. LAWS will have completed their first season of dredging at the end of March and the signage is due to be put in place in May. Please come and check out our achievements for yourself when the Nature Trail reopens in April – a perfect volunteering opportunity for you NE lot! Work on the canoe trail is set to begin as well as going out to tender for the fish barriers required for biomanipulation. In May it will be LIFE’s 25th Anniversary and we are planning an event to celebrate – keep your eyes peeled for more information.